I had a good time at the dog show this past weekend. Me, Dana and Lynn found our way to Priceville Alabama. Polly won BOB with Lynn on Sat. Mona won her first point at 10 months old with Dana. I think I was checked out on vacation <S> me and Maizey came in last or rather RWB. I made a lot of mistakes including dropping the lead as we trotted around the ring. By Sunday I remembered that I was there to win too so on Sunday Maizey won BOB with me finally paying attention:-) Mona got RWB. We ate out a lot, enjoyed chatting, and laughing at our mistakes. The weather was beautiful. Maizey got a new pink elephant toy (she picked it out on Saturday) and a pig ear. We've only had Maizey a little over a year and she only needs two points now to be a champion. She is a beautiful girl and has the potential to be a special. Really, not a lot going on. Jonesy has been going to school for a month now. I am hopeful it will help get him over his phobia of being around strangers in strange places. I posted a new picture of him on Future Stars at class. He turned 1 year old Oct. 29th. He still seems unsure of himself at school but he also appears to be relaxing a little. The baby boys are beautiful and growing too fast. He did very well today. He was a little timid but he did not run from anyone. He really likes Charles the Instructor! However, "I" got a speeding ticket on the way home. It is so hard to believe that they are 11 weeks old already. They are full of life and energy and very happy babies. We are enjoying them. Jonesy starts to school this week. I haven't taken one to obedience class in four years. I was tickled to find the same instructor who helped me with Myles years ago. It should be fun. It is hard to believe that they are almost 8 weeks old. I missed doing their 7 week photos and had to make time to get their 8 week photos done. Life has been going into overdrive around here this past week and it seems I have had no time to do anything but go go go. They are growing like weeds. Johnny and Preacher are looking less like sweet babies and more like leggy teenagers. The babyfaced cute stage is almost over. 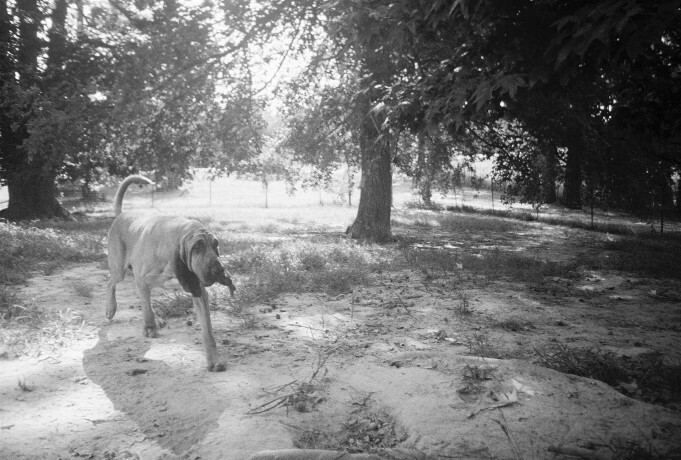 Bloodhounds do not stay little long enough. I cannot wait for the weekend! "Polly" AKA Ch Grand Champion International Champion Mayflower's Shipwreck OFA'd Excellent on her hips. We are very excited about this news. She's the third Mayflower bh out of the second generation to OFA Excellent. Thank Goodness! The new six week puppy pictures are up. These pups are exactly what I love and want. They have a look I've campagined for years in the show ring starting with their Great Grandmother Jama and coming right down to their Mother Heaven. I am so pleased with these boys. I turned 50 today! My husband turned 50 a few months ago and it really bothered me but today for some reason or other I'm okay with it. I had to work so I didn't get to celebrate like I think I should have. For years I barely noticed any kind of birthday or anniversary. To me it was just another day. Now though with the passing of my pets after only 10 or more years (some sooner) I realize that a birthday should be one of the biggest celebrations of all. We should all be happy to know that we've lived another year. Life is a blessing! They are growing up too fast. They are walking, running, playing, barking, growling, etc. They are very up happy puppies. This week we tried stacking them on the table for the first time. Preacher was a real show dog. He was happy, playful and full of himself. Bobby Lee was also a happy boy ready to play. Johnny was a bit shy. He was not too sure of that table. The name was established in 2,000 but, let's face it, when I was born someone must have put a hound in my hand because I've never been without a hound.